Amazing, warm, enigmatic, beautiful and full of symbolism – the boats and the thousands of keys hanging in millions of red threads. There you go: Shiharo Shiota ‘”Key In The Hand” at the Japanese pavilion – one of the best pieces at the 2015 Venezia Biennale! I’ve been to all the Biennales since 2007. My admittedly very subjective view – and what else could it be? – is that this year’s is far from the best. It’s overarching title is “All The World’s Futures” and it has three filters – 1) Garden of Disorder; 2) Liveness: On Epic Duration and 3) Reading Capital.” It is curated by Okwui Enwezor, Nigeria. 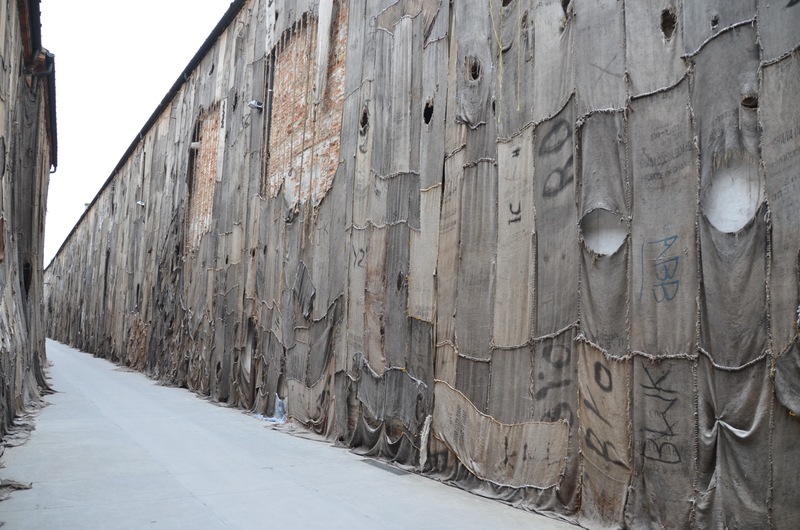 A very long art work at Arsenale – having to do with world trade in cocoa – stamped “Ghana Cocoa Board” – and slavery? It takes place at three places in Venice – the Giardini space (29 pavilions), the Arsenale space (31 national pavilions plus lots of single artists) and all over town in the so-called Collateral Events accepted by the curator. This year it has a record 89 participating countries and over 150 artists. 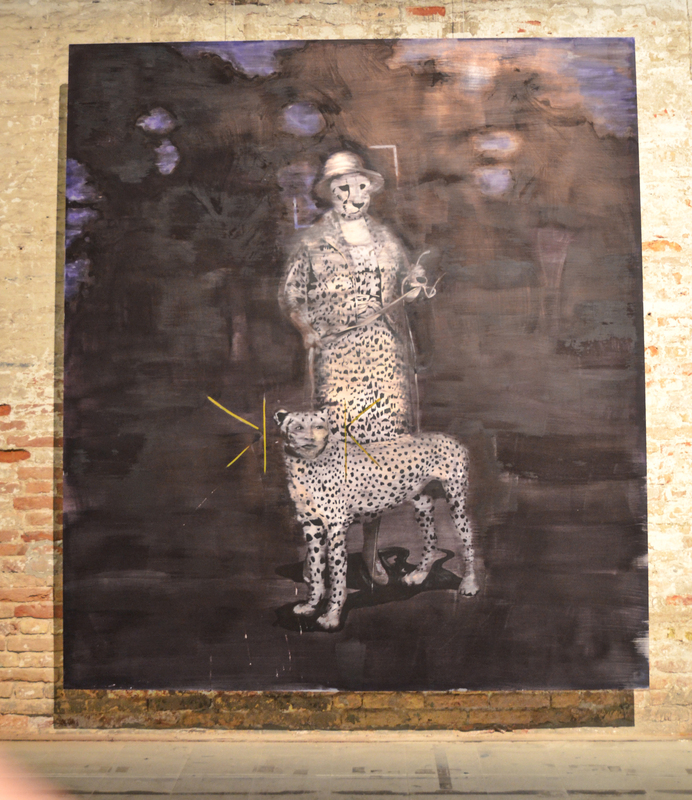 Many see the bi-annual Venice Art Biennale – now in its 56th year as the world art event. 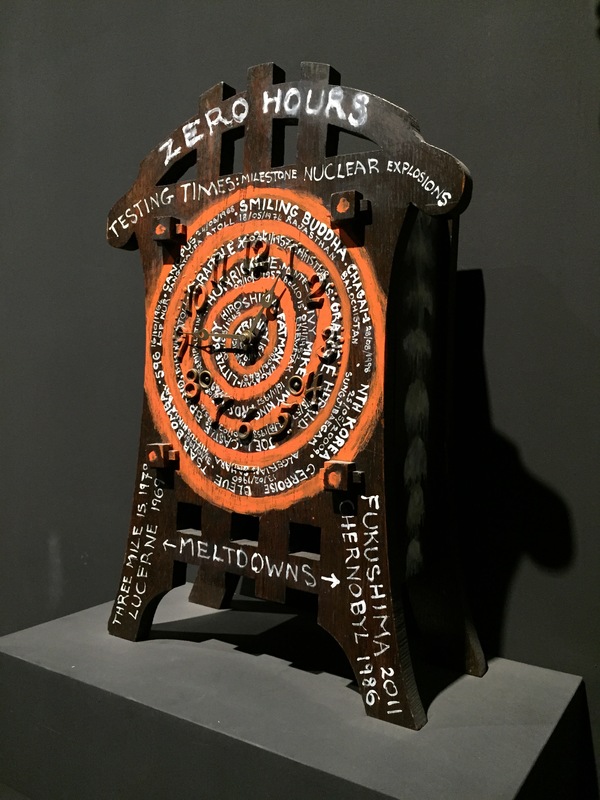 Fiona Hall: Wrong Way Time, the inaugural exhibition in the new Australian Pavilion, attracted 287,690 visitors – a very inventive idea – politically and aesthetically executed. Full of engaging objects and ideas, making you think…and wonder… and feel enriched. And of course it is fascinating. Its diversity is completely impossible to convey to anyone who has not been there. It’s been going on from May 9-November 22, 2015 – and I am here in Venice the last 7 days – to explore and learn as much as I possibly can and with pleasantly few visitors in Venice. I write this first of two articles midways, having still quite a lot to see – but I have “finished” Giardini and Arsenale. The title of this Biennale doesn’t cover its reality. There is surprisingly little about the future of the world but an incredible amount of installations, videos, sculptures, paintings, etc. dealing with the past of the world. Too little focus on visualising or otherwise help the visitor to see the possible future(s) of this world. The Biennale does not only criticize the capitalist-colonialist structures of the world; in a strange way – I can’t really explain this my gut feeling – it becomes expressive of the global crisis more than a pointer or guide to ways out of the crisis towards the better future. To a surprising extent I feel it lacks qualities such as: joy, humour, convivality, erotics, gender aspects, and imagination; there is lots about borders and how they should be abolished – but lots of artists keep within their borders, styles and – well, in their boxes. Revolution in thought, speech and action is certainly not the word to put up over the Biennale gate. While some national pavilions are indeed exciting, the whole concept that you enter a particular building and there you see an artist who has been selected to represent her og his country is now outdated. The nation-state is no longer the most significant building block or unit of the globalizing world – and it will be so less and less in the world’s future. A lot of the stuff here simply does not speak to me as a Danish citizen living in Sweden for over half of my life and seeing myself as a global citizen because I work with peace and conflict issues in different capacities in many and different places. Frankly, there are too many pathetically alienating and incomprehensible texts on the walls to explain works that appear rather simple, if not banal. The ideas behind some works/pavilions have, one feels, been strained ad absurdum and comes across as far-fetched, pretentious. You read a bit, walk around and try to sense or even understand the objects and you mumble… “and so what”? The issue of war and peace – particularly the latter – is surprisingly absent in comparison with art works that focus directly or indirectly on, say, climate change, identity, and the issues of border. OK – there are artists and pavilions depicting warfare and violence – but the vision of a more peaceful future world is virtually absent? Could artists around the world with some more elaborate imaginations, visions or ‘utopias’ not have been invited? Or do they not exist? I’m perhaps beeing too critical here because I walk around here in Venice in the week after the massive attack on Paris (and France’s and other countries’ remarkably un-inventive promises to bomb even more). Colonialism is a good theme – but it doesn’t point you in the direction of a better future world. What really struck me as inventive and thought-provoking, plain beautiful or otherwise exciting or humane? Here is my list of pavilions and/or artists from: China, Hong Kong, Japan, South Korea, Latvia, Australia, Mozambique (first time), parts of the Italian pavilion, South Africa, Romania, Belgium, Greece, Iran (back for the first time since the mid-1970s and integrating her own artists with artists from India, Pakistan, Afghanistan, Azerbaijan, Iraq and Kurdistan (I’ll write a separate article about this fascinating peak point of this year’s Biennale shortly). New Zealand too, for sure. All the spaces are listed here. Generally speaking – very generally speaking within the framework of this Biennale – Western art seems to be falling behind, innovation and creativity moving to Asia, the Middel East and Asia. With a focus on the world’s future, one can only be surprised that the Biennale communicates with its visitors in a rather outmoded manner. For instance, why can I pay anyting online with a credit card or be accepted as a host or visitor at AirBnb – but I can’t get a Permanent Pass (€ 80) online but must queue up for it at the entrance? Why do very few exhibiting nations use apps? Why can’t one get info about a pavilion or artist by downloading an app? There is surprisingly little interactivity here, too scant printed info in most art spaces, too few people being available to the visitor who may have questions or wonder about something? (Most people at the exhibition sites appear uninterested or sit there for security rather than information purposes). And why does a book, say the one for the Iran pavilion, cost € 25 at the pavilion but € 34 in the Giardini Biennale bookshop? Got it !! ? – Israel’s Pavilion – but only as an example; it was far from the only one of this type. The Danish pavilion (below) – well, I had a hard time getting excited. Perhaps I just don’t understand this type of art. If so, I also don’t have to. The British (some kind of allegedly fun fart art? ), the French (a moving tree) and Austrian pavilions (“structure shifts between historicity and modernism” – i.e. sterile and boring) were also rather disappointing to me. Perhaps it looked like this because it was the last days? Serbia’s pavilion – a memento to countries that no longer exist, such as Yugoslavia – with dirty flags on the blood-painted floor. Which could be there in the future – Iraq, Libya, Syria? Arsenale is an old Navy shipbuilding construction. It’s huge! The world should convert all such military facilities to art spaces – and we would have more peace. To give you an impression of how exciting some of the old buildings of Arsenale really are, here is one example. Each is different from the next and in the best of cases, art and environment play to each other in harmony – or exciting contrasts. And – yes!! – there is a lot to see, in fact too much for both a young one and for an old one like me. But I would not be without any of it. In the midst of a gloomy world with wars, militarism and racism, the art world is still doing no harm but manifests creativity and struggle and gives me hope.